On Jan. 20, the U.S. District Court for the District of Columbia granted the U.S. EPA an extension of only one month to release the final MACT rules. This was after the EPA had requested a six- or 15-month extension past the Jan. 16 deadline. Agriculture Secretary Tom Vilsack announced Jan. 20 that USDA Rural Development has selected for funding 68 study grants to determine the feasibility of renewable energy projects. Studies will be funded in 27 states and in the Western Pacific. By the middle of 2013, Graphic Packaging International Inc.'s Macon, Ga. paperboard mill will have a 40-megawatt, $80 million biomass power plant that supplies 100 percent of its electricity and steam needs. The plant will utilize logging residuals. Evonik New Energies UK Ltd. and renewable energy developer HES Biopower Ltd. have proposed a biomass combined-heat-and-power plant for the county of Kent in southeast England. The plant will use waste wood that would typically be sent to landfills. A wide gap in Btu value exists between a biomass feedstock of say 30 percent moisture and one of 50 percent moisture. With that in mind, GeoSynFuels Inc. will conduct research into a biomass press to simultaneously densify and dewater biomass. The BTEC is holding a webinar Jan. 27 to discuss the national political environment for advancing biomass thermal energy policies in the U.S. 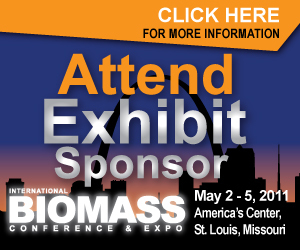 The free webinar is titled Biomass Energy-A Policy Outlook: Programs, Legislation and the New Congress. Havana Energy Ltd. has teamed up with Zerus SA, a company linked to the Ministry of Sugar, to develop a 30-megawatt pilot power plant at Ciro Redondo Sugar Mill, about 400 kilometers from Havana, and use it as a model to develop more power plants. The Gainesville Renewable Energy Center has initiated a fuel supply relationship with Rayonier to supply logging residue, precommercial thinnings and other clean, renewable wood fuel for the proposed 100-megawatt biomass plant in Gainesville, Fla.
EPA recognized six landfill methane projects for their innovation in generating renewable energy and protecting the climate and people's health by reducing GHG emissions. EPA has assisted with more than 490 landfill gas projects in the past 16 years.